Yesterday we met with our oncologist, Mike Meshad. He had talked with Dr. Nabors, UAB neuro-oncologist, and had seen last week’s MRI. Usually he’s very friendly but we’ve never seen him so effusive and upbeat. He walked in the room and said, “I know you two are thrilled!” and then, “Looks like Gorman is going to be around for a while”. Apparently he had not anticipated a clear MRI. At two and one-half years out, this seems to be quite a milestone. Last week when we met with Dr. Nabors, he suggested that Gorman begin receiving the Avastin infusion every three weeks, as opposed to two; get another MRI in three months and then go to every four weeks for the infusion and eventually stop it altogether. When I asked what medicine would come after that, he said, “There’s nothing after that. We don’t get too many patients who have made it this far”. I immediately told him it was because of prayers. I have given much thought to that conversation with Dr. Nabors and my comment. I don’t know what to say about someone who has prayed for healing or for remission and didn’t get it. I don’t know what to say to my friend whose daughter died with a brain tumor. Certainly we all prayed for her. All I can say is that I have known for sure, throughout this cancer journey, that God has been with me every minute of every day. I am not a brave person; He has given me strength. There have been times, oh so many times, when I was scared to death and He comforted me and filled me with peace. And I know without a doubt if Gorman’s cancer returns, God will be with us and see us through it. Someone said the basic religious principle is that God isn’t there to take away our suffering or our pain but to fill it with His presence. He has done that for Gorman and me. It’s so much fun sharing with all of you these positive comments from our doctors. We are so encouraged and it feels good to spread good news. But please keep us in your prayers. 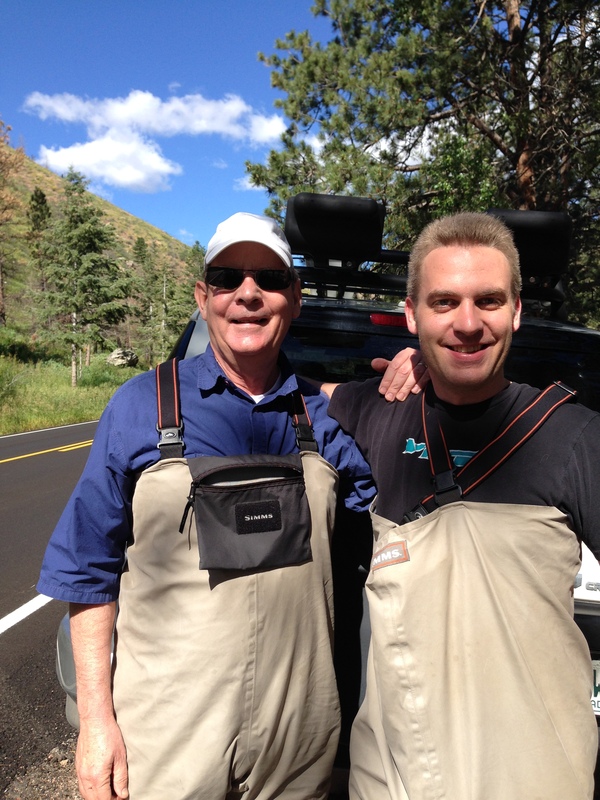 Two weeks ago we flew to Colorado to visit our younger son, Grady, who lives in Ft. Collins. It’s such a nice city with the mountains in the background; warm temperatures but no humidity which makes it so pleasant. 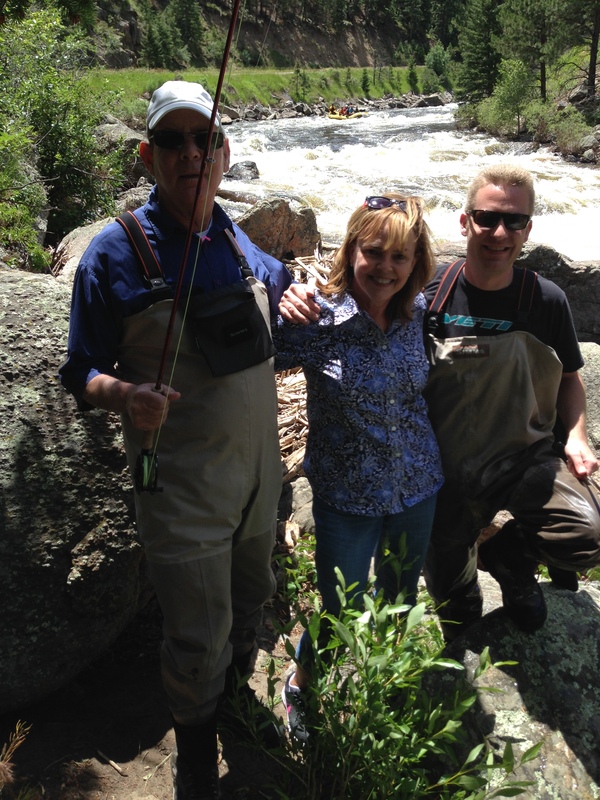 On a beautiful sunny Saturday we met our guide and went fly-fishing on the Poudre River. We drove up in the mountains where the river was so clear and really moving fast. There were loads of white-water rafters out there too. 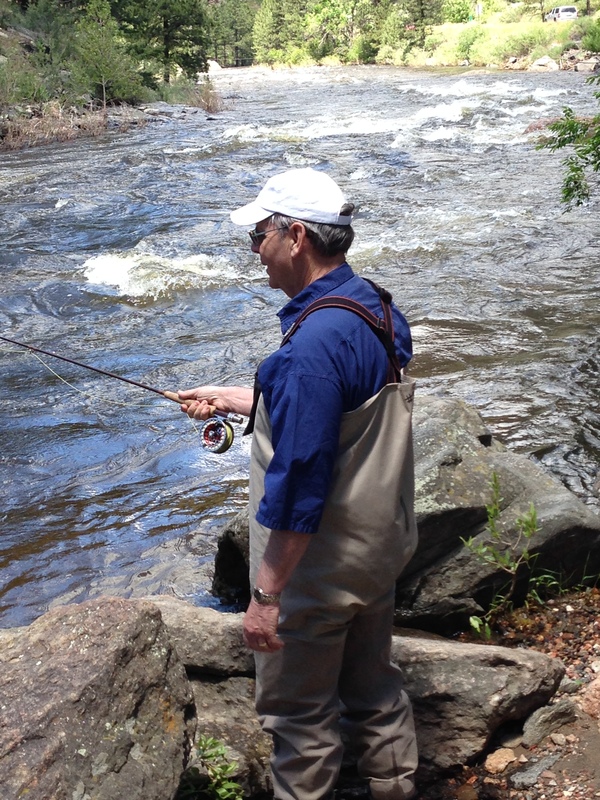 Gorman and Grady caught lots of brown trout and rainbow trout. 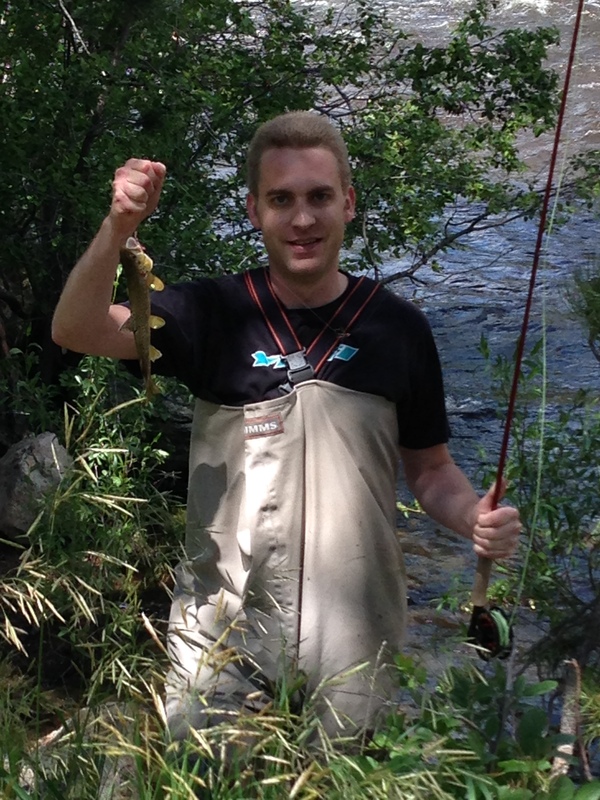 It’s catch and release in Colorado but they had fun. 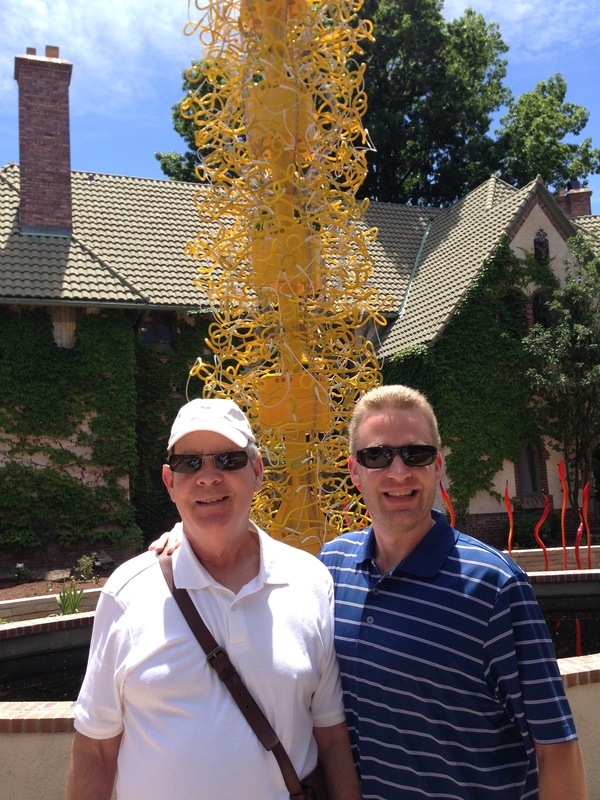 Monday we drove into Denver to see the Dale Chihuly outdoor glass exhibit at the Denver Botanic Gardens and that was fabulous. We had seen his amazing glass pieces before but never these large architectural pieces mixed in among the plants and trees of a garden. It was amazing. For anyone who’s interested, go to ChihulyInDenver.com. And now the MRI is looming. It has been a lovely three months since the last clear one and we have enjoyed every single day, especially the regular ordinary ones where we do nothing special but just go to breakfast, say our prayers, read, cook, work in the yard, take a drive. Those days are a treasure. But Sunday afternoon we will drive to Birmingham. Gorman’s MRI is scheduled at UAB Monday (July 14) at 9:30 and then we meet with Dr. Nabors at 11:00 to hear the results. Of course, we are praying for a clear MRI but also for the peace that God gives us, that peace that surpasses all understanding that will see us through, no matter what the future holds.